Vertical Gardens are a great way to build an indoor garden for your apartment gardening DIY project as they are easy to manage and a perfect space-saving idea. Using this vertical gardening idea you can begin to store your delicate plants over the winter gardening months in your space efficient indoor garden – a great DIY project! Using this idea you can grow a range of herbs and even build an indoor vegetable garden. Vertical garden ideas are creative in nature. Most people have a smaller space which they can utilise to create a vertical garden. One may also build the garden alongside the homestead, on the balcony, an outbuilding or patio. 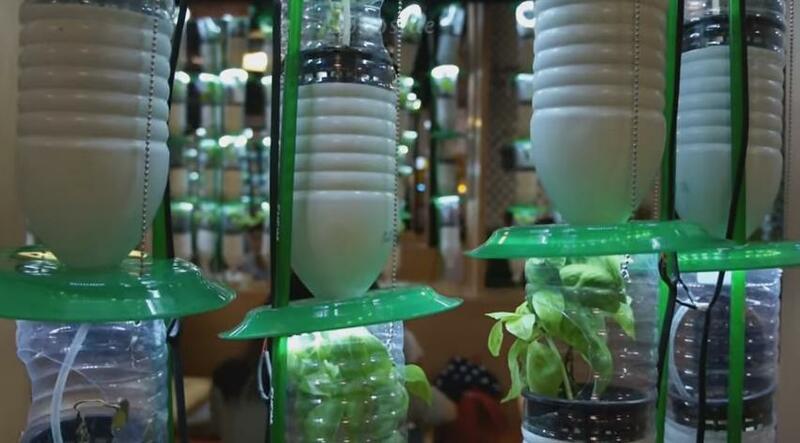 Recycling used up bottles to make a vertical garden can save you money and help you save the natural environment. The bottles are of different sizes and shapes. Therefore, they provide room to grow small vegetables or a single plant. One can also grow a garden of flowers that are colourful and place them around the homestead. Take the plastic bottle of any kind or shape. Use a craft knife to cut the top part of the plastic bottle. Where the sides straighten, remove the top part. Use a nail and poke twice or thrice, a diameter of 1/5 inches. These holes would aid in drainage when watering the plants. Now get wooden stalks and install them on the garden bed, 2 by 2 inch, 4 feet apart. Push the stalks down the soil so that they can anchor well, 12 to 14 inch. Whenever you are thinking of placing the garden on the patio, use at least 6 gallons of sand for the stake to anchor. Take a wooden sheet 4 by 8 foot and nail it to the stakes. On the plastic bottles, poke holes on each side. Ensure that the holes are 3 inches down from the top. Let a piece of wire into the bottle by pushing it through the holes on the bottle. The wire should pass to the second set of holes. Around the trellis, wrap the wire around. Ensure the open part of the bottle face upwards while securing it against the frame. One should attach all the bottles by using the same process. These bottles would be placed in a row. Fill the soil in the bottle to make a potting mixture. Make the mixture moist by adding water in it. In each bottle plants a single seedling. All the seedlings should be a place on the same depth in each bottle as it was once in the nursery bottle. Be constantly checking soil moisture on daily basis and add more water. Take a recommended fertilizer and dilute it before adding to the bottles. Fertilize the plants twice a week. Vertical Gardening Ideas by DIY Indoor Gardening is licensed under a Creative Commons Licence.